Did you know you can find The Press Office on Twitter? 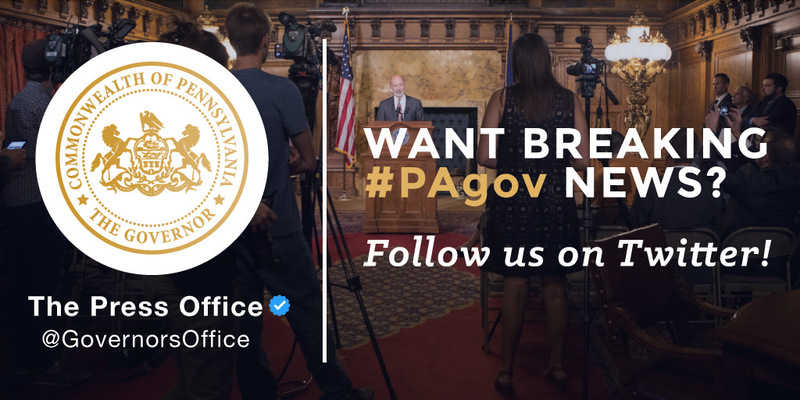 If you’re interested in all the breaking news coming from Governor Tom Wolf’s Press and Communications Office, we’ve got you covered. From press releases to live video streams, keep up with it all by following @GovernorsOffice on Twitter. Want to be the very first to hear about breaking news? Enable mobile notifications on your Twitter app for the @GovernorsOffice account and you’ll get a push notification every time we post. By following @GovernorsOffice, you’ll also get first access to photos, videos, and more. Take a look at what you’re missing — and then make sure you follow us on Twitter.